TIP: Stir-fry the ingredients over low heat. TIP: Add the red chili paste last. TIP: Use a mixture of starch and frying powder to coat the rockfish for frying. TIP: Shake off the coated frying powder moderately. TIP: Put the ingredients when the oil temperature reaches 180 degrees C.
1. Stir-fry the green onions, shiitake mushrooms, onions, chili peppers, red chili powder together with soy sauce and starch syrup. 2. Coat the rockfish with the prepared condiments before steaming it. Rich in essential fatty acids, iron and calcium, the rockfish is good for growing childre. 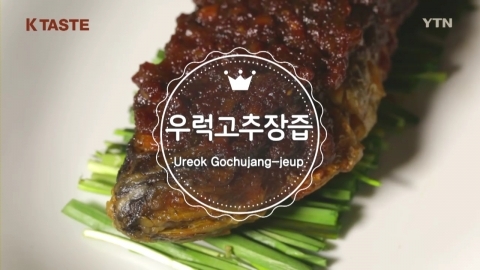 Try Ureok Gochujang-jeup (Rockfish-Red Chili Paste Juice) made with rockfish, called "a treasure from the ocean".